Four out of four ain't bad especially if three of them are over old rivals Mt Gravatt! It was a great day of football on Sunday if you are a Magpies supporter and in any case with the Pies wearing their indigenous guernsey and NAIDOC Day celebrations pre match and at half time it was simply a celebration worthy of our great game. The weekend also started with a comfortable victory for the Woodsmen to see them consolidate on top of the QFA Division 4 ladder and if you're true 'Blacck & White' the Pies knocked over the Dons 45 minutes after the Seniors finished off the Vultures! The Magpies NAIDOC Day celebrations with Welcome To Country from aboriginal elder and traditional custodian of the land Uncle Des Sandy and the Smoking Ceremony from another traditional custodian of the land Greg Duncan were fantastic and a poignant reminder of the link the indigenous peoples have with the land. It was great to see Anthony Corrie and Mt Gravatt's Jesse Green showing respect to each other before the bounce but also during the Smoking Ceremony as they passed through the smoke. The players and umpires and the Pies Reserves all lined up in a wonderful pre-match ceremony. Torres Strait Islander dance troupe Zom Kolbe Kolbe entertained the crowd at halftime with a dance and the crowd was very attentive and appreciative of the music and dancers. The match was played in front of a good sized crowd and it was great to see a number of past players at the ground to support the Magpies. Maybe a few more Sunday fixtures could be scheduled if Sunday's crowd is any guide. The Magpies started like a house on fire with a return to some free wheeling football which netted them 6 first quarter goals before Mt Gravatt got started. For some unknown reason the Pies put the cue in the rack and started to play more cautious possession football which allowed Mt Gravatt to steady and work their way into the game. The Pies were only 3 goals up at the final break but put the game to bed with a dominant last quarter. The following article appeared in Quest Newspapers Westside Satellite this week, flattering pic of Lasho! None of the Magpies back 6 were named in the best on Sunday but they are rapidly becoming a very good defensive unit and they work hard to get to the contest to help their teammates then run to create rebound attacking opportunities. David Lewis, Luca Winton, Luke Mitchell, Doug Lawrence, Aaron Highlands and Mitchell Stallard on Sunday were all good players and you can add Brady Allen, Stephens Mills and Jack Goodall to that mix when they are down back. The Pies tackling was a highlight on Sunday and none better than Riley Easton who laid at least 10 tackles and did not fall off one tackle for the day. He also won the football plenty of times and was named the Pies best player. Speaking of tackles, the tackle laid in the third quarter by Mitchell Stallard was a ripper and almost spit the Vulture's Fraser Neate in half. The resultant spillage stopped a potential goal and won the ball for the Pies. To the Mt Gravatt player's credit, although shook up, dusted himself off and returned to the fray soon afterwards. Jake De Winter led the Pies votes in the Syd Guildford Trophy with 9 out of a possible 10 votes after he booted 5 goals. Other Pies vote getters were Riley Easton 7, Drew Mitchell 6, Anthony Corrie 3 and David Lewis 1. De Winter's 5 goals took him to second on the QAFL goal kicking ladder with 31 goals, trailing Broadbeach's Matt Fowler on 34 goals. Luke Mitchell had several dashing runs out of half back early in the game which set up a couple of Pies goals. "Squirtle" certainly showed a bit more speed than he has been credited with and was the BG Award winner for the match. With a bye this week the Magpies headed to Yeronga Pool for training on Tuesday night . There was an interesting request from the Pies Conditioning Coach, Daniel Petch, who asked all players to wear speedos aka budgie smugglers--something to do with glute activation!! We might leave it at that!! 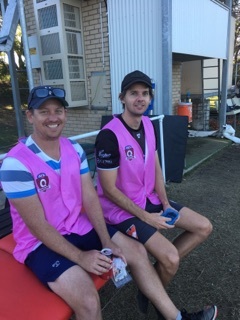 In keeping with the bye weekend, Coach Brydan Morgan arranged for three QAFL field umpires to attend training on Thursday night and run through several scenarios for the players and help them understand the rules and how they will be umpired. The Pies hopefully will now get on the credit side of the ledger after seemingly getting the rough end of the pineapple in recent matches. The Reserves had a great win over the ladder leaders to re-ignite their finals aspirations. With a plethora of players with Senior experience in the side, the Pies were able to get on top in the last quarter to win a top class contest with the scores seesawing all match. The depth the Pies have now will put them in good stead in both Seniors and Reserves as the business end of the season approaches. With the likes of Gareth Crawford, Lachie Dennis, Val Pope, Liam Dwyer, Logan Murray, Sam Hartog, Harry Marshall, Jack Austin, and Chris Hunt all in good form and Tom Ielasi and Brady Allen to return the Pies depth looks particularly healthy. The Colts had a comfortable victory over the bottom placed Mt Gravatt and the win takes them back to the top of the ladder. The Pies looked slick at times with rapid ball movement and they work hard to help each other. They were guilty of over using the ball at times but were never in danger after booting the first 5 goals of the match. Young ruckman Oscar Prior relished his chance in the absence of several of the Pies bigmen and Jacob Aurisch and Ryan Cherry are both strong looking footballers and were good players on Sunday. The Colts depth is also strong and they will approach the latter half of the season with confidence. They will be keen to reverse their narrow loss to Palm Beach-Currumbin earlier in the year when they clash next Saturday. The Woodsmen also went to the top of the ladder after a strong victory over Collingwood Park on Friday night. It was good to see youngster Matt Mazarolle boot 4 goals after he was left out of the Reserves to make a strong case for a return next week. In fact, he did not have to wait that long as he was brought back into the Reserves on Sunday after Tom Ielasi withdrew with a virus. Matt took a couple of strong marks and kicked a crucial third quarter goal in the Reserves to make it hard to leave him out next week. Competition leading goal-kicker Matt Hockley though had a rare night where the radar was off target, registering 2 goals 6 for the night and possibly a couple that fell short as well! The Woodsmen travel to Maroochydoore this Saturday for a top of the table clash, could be an interesting affair given the competition is meant to be played on Friday nights and half the team is unavailable for Saturdays! Colts Assistant Coach and Woodsmen games record holder Kiran Verma is what would be generously called a " footy nut". "Special K" just loves his footy and loves the Pies. He has only missed about 3 matches for the Woodsmen since starting in 2008 and until this year, regularly saddled up in the Reserves (30+ games) when they were short of players, often after playing the night before. Not to be outdone, he has also played this year for Yeronga and Griffith-Moorooka to help them out when they were struggling for players, especially at Yeronga to assist ex teammate and Magpie coach Sam Long. In fact when he played for Moorooka they were narrowly defeated -- it was the closest they had got to a victory in a season of heavy defeats so far. The knowledge, maturity and love for footy and the club he is imparting to the Colts players is an invaluable part of their development as players and good people. Tom Ielasi returned last week from a trip to the World Cup in Russia and he said it was good to be home. He enjoyed his time there and watched two of the Socceroos three matches but sold his ticket to the third match. He said Kazan was good but Samara was a dirty industrial city with not much entertainment and night life--in fact he used the word "boring" at one point. He said one hotel he stayed in swayed and shook whenever a truck went past and all the plumbing was up and down the walls--not inside them!! Tom said Brisbane and Oz is a pretty good place to be! Good to see a few familiar faces running the water on Saturday with Will Fozard and Pat Garner running water for the Seniors. Also great to see Monty Vine, Sam De Nys and Tom Roderick also run water for the Reserves despite the disappointment of being left out of the Reserves team on Sunday. Tom has been in fine form for the Woodsmen on a wing and just keeps putting in on and off the field in a great display of "team first" attitude. The Magpies have a big weekend next week with the 1978 Sherwood Premiership team celebrating the 40th Anniversary of their comfortable premiership victory over Mt Gravatt and the 2008 Western Magpies team celebrating their famous win over Palm Beach-Currumbin. Fittingly the reunion will be in front of a Pies-PBC clash which has all the hallmarks a ripping contest with the current Pies hitting form up against the undefeated QAFL ladder leaders and defending Premiers. Current players Ben Jaenke-Cain, Val Pope, Gerard Moore and Sean Mewing were members of the 2008 Premiership team and Kale Reed, Sean McEvoy, Gabe McKinnon, Reid Dobson and Peter Kilroy played in the Reserves Grand Final the same day. Current Broadbeach player and Magpie junior Matt Fowler was also a member of the Pies Premiership team. There will be stories on the 1978 and 2008 Premierships in the coming week leading up to the reunion.